The IDMX500 Studio Light with Touchscreen and DMX Control is designed and built for photographers, videographers and cinematographers who want professional quality at an affordable price. The Daylight 14” x 7 1/4” LED Studio Light delivers field-tested reliability, solid construction, and all the features required for professional performance. The IDMX500’s features include energy efficient 5600K LEDs, a wide 60-degree angle, and full DMX capabilities that delivers reliable, consistent performance. The IDMX500 LED Studio Light features 500 energy efficient 5600K LEDs that are dimmable in 1 step increments from 0-100% using the LCD touchscreen. If the light is mounted overhead or cannot be reached, the IDMX500 is DMX controlled for dimming and powering the unit on and off. An integrated yoke mount makes the IDMX500 easy to set up. A multi-voltage power supply is included. The pre-mounted four leaf barn doors can be folded flat for transportation. 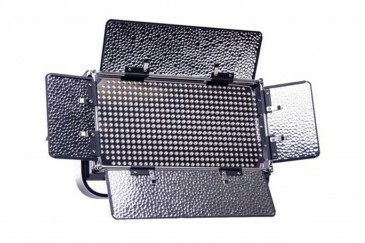 IDMX500 lights are also available in different kit combinations that provide added value that may include stands, bags and other accessories.